Hugh Fortescue, 1st Earl Fortescue was born on 12 March 1753.2 He was the son of Matthew Fortescue, 2nd Baron Fortescue of Castle Hill and Anne Campbell.2 He married Hester Grenville, daughter of Rt. Hon. George Grenville and Elizabeth Wyndham, on 10 May 1782.2 He died on 16 June 1841 at age 88. Her married name became Fortescue. After her marriage, Hester Grenville was styled as Baroness Fortescue of Castle Hill on 10 July 1785. 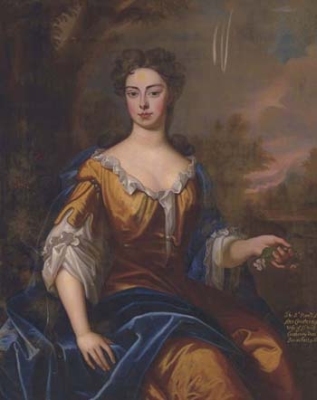 After her marriage, Hester Grenville was styled as Countess Fortescue on 1 September 1789. Edward Baldwin Courtenay, 12th Earl of Devon was born on 7 May 1836.1 He was the son of William Reginald Courtenay, 11th Earl of Devon and Lady Elizabeth Fortescue.1 He was baptised on 15 June 1836. He died on 15 January 1891 at age 54, unmarried.1 He was buried on 20 January 1891. Sir William Courtenay, 2nd Bt. was born on 4 March 1675.1 He was the son of Francis Courtenay and Mary Boevey.1 He married Lady Anne Bertie, daughter of James Bertie, 1st Earl of Abingdon and Eleanora Lee, on 20 July 1704.1 He died on 10 October 1735 at age 60.1 He was buried on 11 October 1735 at Powderham, Devon, EnglandG. Her married name became Courtenay. Children of Lady Anne Bertie and Sir William Courtenay, 2nd Bt. Her married name became Courtenay. After her marriage, Lady Anna Maria Leslie was styled as Countess of Devon on 15 January 1891. Her married name became Pepys. After her marriage, Caroline Elizabeth Wingfield was styled as Baroness Cottenham on 20 January 1836. After her marriage, Caroline Elizabeth Wingfield was styled as Countess of Cottenham on 11 June 1850. [S2] Peter W. Hammond, editor, The Complete Peerage or a History of the House of Lords and All its Members From the Earliest Times, Volume XIV: Addenda & Corrigenda (Stroud, Gloucestershire, U.K.: Sutton Publishing, 1998), page 209. Hereinafter cited as The Complete Peerage, Volume XIV. [S6] G.E. Cokayne; with Vicary Gibbs, H.A. Doubleday, Geoffrey H. White, Duncan Warrand and Lord Howard de Walden, editors, The Complete Peerage of England, Scotland, Ireland, Great Britain and the United Kingdom, Extant, Extinct or Dormant, new ed., 13 volumes in 14 (1910-1959; reprint in 6 volumes, Gloucester, U.K.: Alan Sutton Publishing, 2000), volume III, page 460. Hereinafter cited as The Complete Peerage.